The HTML Editor is a tool provided within InterConnect Manager Add-On to allow editing of collection descriptions and web product descriptions. It provides a preview of basic formatting (without theme-specific css) such as headers, paragraph text and other content. The HTML Editor is available in the description field of web products and collections edit screens. After using the HTML Editor to update content it’s saved in the description field as html text. For a walkthrough of managing web product details (including HTML-based description), see Product Details Management. For a walkthrough of managing collections (including HTML-based description), see Collections Management. 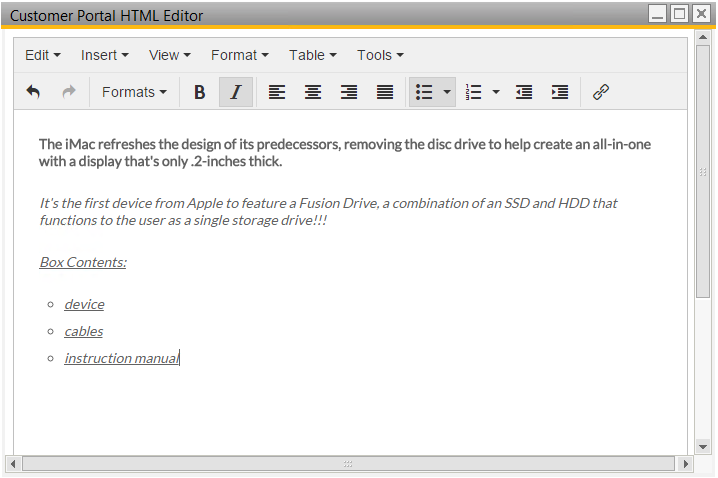 Use the HTML Editor to edit web content for collections and items in SAP Business One. The Format menu contains options for text formatting such as Bold and Italic. The Insert menu contains options for inserting links and special characters.